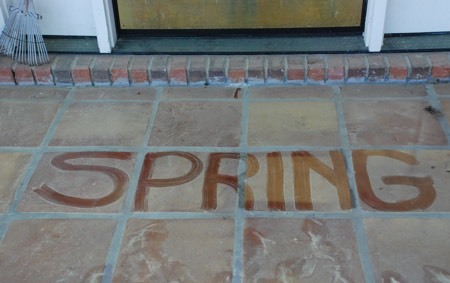 Spring is here: a time for new beginnings, fresh starts, and spring allergies. Billions of tree pollen grains (mostly from oak, cypress, and bayberry) will float over our yards, cars, ponds, and doormats for the next 6+ weeks. And this is nothing new. Back in 2002, Tampa made the top of WebMD’s list of the worst towns for bad spring allergies. According to the Allergy and Asthma Foundation, things have improved for Tampa’s spring allergy sufferers since then. Here in Tampa, we’ve got 11 species of oak alone spewing billions of pollen particles into the air. Park your car under an oak tree for any amount of time during pollen season and you will find it covered with a familiar greenish-yellow pollen. If you’re one of the people who suffer from seasonal allergies, this time of year can become a blur of runny noses, sneezing, itchy eyes, headaches, fatigue, difficulty breathing, and coughing. Allergic symptoms like these, along with inflammation and swelling of nasal passages, may turn into sinus infections, asthma, earaches, and upper respiratory infections. Many people don’t know that seasonal allergies also can worsen depression, digestive issues, and joint pain. Rather than temporarily alleviating these symptoms the way allergy medications do, acupuncture and Chinese herbal medicine treat the root cause of the symptoms and over time help your body reduce future allergy symptoms. From a biomedical perspective, when plants release their pollen, some people’s immune systems overreact, turn on their attack responses, including the release of histamine which causes inflammation and muscle constriction. Problem is there’s no invader and our bodies are confusing our own cells with “the attacker,” unleashing a storm of immune reactions including extracellular fluid leaking, swelling, dilated vessels, increased blood flow and draining. In acupuncture theory, seasonal allergies are not isolated to the histamine response. Rather, they are seen as a general disruption of a person’s self-protection mechanisms. Instead of accepting the overreactive immune response and suppressing it with antihistamines, acupuncturists ask, why is this person’s immunity compromised? And what can we do to bring it back to balance? In acupuncture theory, a person who develops allergy symptoms after being outside is often treated for something we in Acupuncture Land call “Wind.” In Chinese medicine, our traditional diagnosis often sounds like a weather report. Wind as a source for disease is characterized by a sudden onset of symptoms, itching, and changeability. An untreated Wind condition over time can lead to other conditions that involve symptoms linked to Heat or Dampness. To modern eyes, Heat and Dampness in our nose looks a lot like a sinus infection– think yellow discharge, swelling, and pain. Regular acupuncture treatments optimize immune function and can often prevent future infections. And if you need more support, Chinese herbal treatments can reinforce the effects of acupuncture. Seasonal allergies are something many people have come to accept as an inevitable part of springtime, a trade-off of sorts for the warm weather. It doesn’t have to be this way. Chinese medicine can relieve and prevent seasonal allergies, without negative side effects. So go out and celebrate spring, no strings—or Kleenex—attached. Thanks to Arizona acupuncturist Britta Van Dun for inspiration from her article Allergies Have Sprung.